On June 4 2017 it was 75 years since the Battle Of Midway took place. To commemorate this I had the idea of building as many of the participating aircraft types as possible. I have managed to include all of the types included in the battle order on Wikipedia. 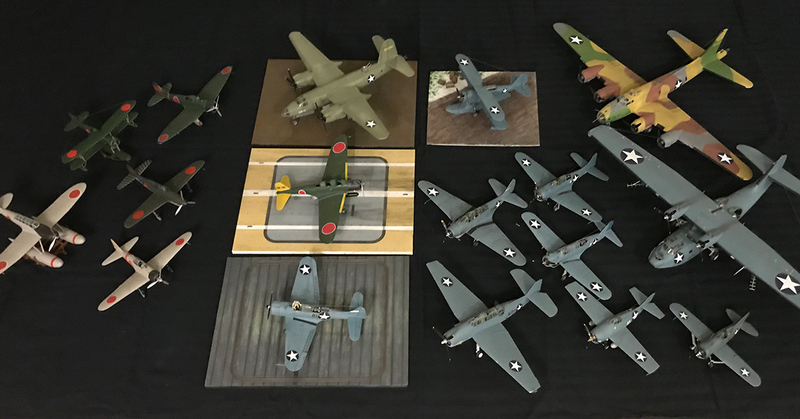 Here is the story about the planes I've built with several pictures of every model. This is not the complete story of the Battle Of Midway even if I tried to keep things in chronological order. There are several books available on the subject as well as other articles on the web if you want the whole story. This is the story behind each individual plane I've built (my take) with pictures of the models. I've used several web sources to compile this and I have a link list on each the page if you want to read more. A good start is of course Wikipedia: https://en.wikipedia.org/wiki/Battle_of_Midway I've also read several books on the subject but I think the best (at least from the Japanese perspective which is not as well documented as the American perspective) is Shattered Sword - The untold Story of The Battle of Midway by Jonathan Parshall and Anthony Tully (see here).